DOES GENESIS HAVE GAPS IN THE GENEALOGIES? More from Dr Travis Freeman. He serves as Professor of Old Testament at the Baptist College of Florida in Graceville. He is a graduate of Ouachita Baptist University (B.A.) and Southwestern Baptist Theological Seminary (M.Div., Ph.D.). He has been a young-earth creationist for over twenty years and is a member of the Evangelical Theological Society Creation Fellowship. He chats with Dr Jonathan Sarfati of Creation Ministries. Go to http://www.creation.com for more from Jonathan. Sadly, many Christian colleges teach that there are gaps in the genealogies of Genesis 5 and 11. Dr Freeman points out that there can be no time gaps, because: The biblical text gives the number of years between the births of the descendants of Adam in the line leading to Noah. By adding these numbers together, we can calculate the number of years from Adam to Noah. These numbers would be superfluous, even misleading, if generations are missing between fathers and sons. In fact, one strains without success to even imagine why the author of Genesis would include these numbers unless he meant to tie the generations together in a continuous sequence without chronological gaps. Why was this clear understanding doubted from around AD 1800? Dr Freeman reminds us this is when old-earth ideas started to become popular in ‘science’, due to the Flood-rejecting uniformitarian dogma of Hutton and Lyell, explicitly designed to “free the science from Moses.” Long-age beliefs almost invariably come from such outside ideas being imposed upon the text, rather than anything in the text itself. God created all things in six twenty-four-hour days about 4004 BC in mature form. God created all living things according to distinct kinds that were programmed to produce only their kinds but able to adapt to their environment within their kinds. God ravaged the earth with a catastrophic flood which began about 2348 BC, lasted about a year, covered the entire world, destroyed and rebuilt Earth’s crust, left behind millions of fossils, left behind vast coal and oil deposits, and permanently altered Earth’s environment. Since Dr Freeman teaches at a school that affirms the inerrancy and sufficiency of Scripture, I asked how all that is supported by the Bible. He pointed out that Genesis 1 declares that God created all things in six days. He explained that when modified by a number or by the phrase ‘evening and morning’, the Hebrew word for ‘day’ always means a solar day, not an indefinite period of time, in the Old Testament. Also, the same chapter describes Adam, Eve, fruit trees, and other living things as mature at the time of their creation, and it says that they would reproduce after their kinds. That is, one created kind did not evolve into another, leading eventually to a group of human-like creatures. Dr Freeman also stresses that Genesis 7 and 8 describe the Flood of Noah’s day as year-long, worldwide, earth-devastating, and deadly to all land vertebrates but those on the Ark. These things would be responsible for the formation of most of Earth’s sedimentary rock layers and fossils. Moreover, it is encouraging that more geologists now recognise that catastrophism provides a better explanation for the geomorphology we observe today than uniformitarianism. In the famous tale from Homer’s “Odyssey” the fortress of Troy was defeated by the Greek army leaving a large wooden horse (secretly filled with soldiers) behind as a supposed gift. The Trojans willingly took it into their city leading to their defeat. This video retraces how ‘deep time’ infiltrated the church in a similar way, and led to the lack of biblical authority we see today. 1 Chronicles 1 and Luke 3 take these genealogies to be completely historical. So theistic evolutionists who would relegate these genealogies to mythical status have to reckon not only with the plain teaching of the chronogenealogies, but how the rest of Scripture treats them as well. The first genealogies we find in Genesis (in chapters 5 and 11) are called ‘chronogenealogies’ because the age of the father at the birth of the son are given. This allows us to know with a very high degree of accuracy (within a year) how much time passed during each generation. It also lets us know there is no gap between the names. The most noticeable element of the genealogy is the steady decrease in lifespans. The antediluvians all seemed to live very long lives. But after the Flood, each generation lives shorter and shorter lives, until many children die before their longer-lived parents, and even before grandparents and beyond. By the time of Abraham, lifespans were only about twice what we experience in the modern-day world. These genealogies are actually indications that Genesis intends to be taken as history, and not myth, because the chronology claims to set each person in a specific place in history. 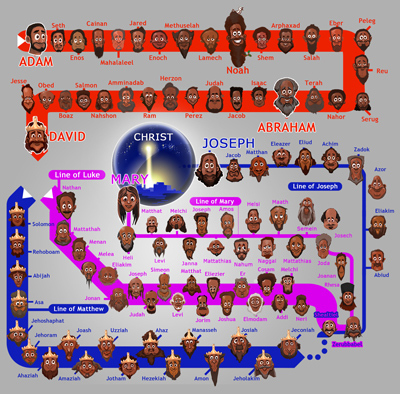 Many of the people in the genealogies are not mentioned elsewhere in Scripture, so their only purpose seems to be to link one important character with another (linking Noah back to Adam, for example). By the time Moses wrote Genesis, most of these names would not be otherwise significant to the Hebrews. The purpose of Matthew’s genealogy was to trace the legal line of rightful heirs to the throne of David. This of course included biological descent, but also some ‘adoptive’ relationships where a man had no descendant, or whose descendants were disqualified. Matthew’s genealogy used obvious ‘telescoping’ where less important people were omitted. Matthew claims that his choice of names is significant because of the number of generations listed “So all the generations from Abraham to David were fourteen generations, and from David to the deportation to Babylon fourteen generations, and from the deportation to Babylon to Christ fourteen generations” (Matthew 1:17). The most plausible significance for this is because the numerical value of the letters in David’s name added up to 14. God is in total control of history. After all it is HIS story. When we interpret the genealogies correctly, we see that they are trustworthy historical records. Luke’s genealogy looks a lot more complete, and was probably the biological genealogy of Mary, so we see Jesus’ biological ancestry from David, and from Adam. We would expect that Luke would want to give us a complete chain to link Jesus biologically with David. But from Adam to David, he uses the Old Testament sources which indicates his confidence in them as Jesus had total confidence in them – Mt 5:18. Luke’s genealogy is unusual in that it starts with Jesus and goes back to Adam—all the other genealogies go from father to son. This allows it to end with, “the son of Adam, the son of God.” This means that the genealogy starts and ends with a “son of God”, and nicely makes the theological point that Jesus is linked to all of humanity via common descent from Adam. When we look at the biblical genealogies, we have to appreciate the purpose behind each of them, and that helps us to interpret them correctly. And when we interpret them correctly, we see that they are trustworthy historical records.